This volume captures some of the ways contemporary African philosophy is done in an intercultural manner. The contributors to this volume are all young scholars; some of them recent PhDs; all educated and trained in Nigeria and exposed in their philosophical training to what some have called global philosophical training, which is the standard form of philosophical training in Nigerian universities – namely, the standard philosophical curriculum in the Anglophone West supplemented by courses in African philosophy, oriental philosophies (Indian philosophies, Chinese philosophies, etc. ), Islamic philosophy. These scholars, who prior to their university education had already been steeped in their native language, culture and philosophy in formal and informal ways as well as in English language through formal education were, thus, further educated in a highly intercultural manner. However, intercultural philosophy as a perspective and approach to philosophy is in a nascent stage in Nigeria and indeed in Africa and the world generally. The articles in this volume reflect intercultural philosophy in diverse ways. Amos Ameh Ichaba addresses the issues of freedom, determinism and change by reference to approaches and concepts developed in the West and little reference to ideas on the issues developed in Africa in the past and by contemporary African scholars. This has been called the universalist approach but it is erroneous to regard it as such. This is because the approaches, perspectives and concepts developed in the West are not the products of the only way of doing philosophy nor do they generate universal, non-contextual, objective truths. Ichaba’s contribution is intercultural in the sense that he goes beyond his primary language and culture of existential engagements and creativity to pursue philosophical analysis in the language and idiom of English, his secondary language and culture. It can be expected that he would be influenced in his work by his primary language and culture and the circumstances, historical and otherwise surrounding both. Philip Adah Idachaba and Adejoh Sylvester Ogba’s contribution comes from the identitarian perspective in postcolonial African scholarship. The relationship between the West and non-West is characterized by hegemonic coloniality. The purpose of intercultural philosophy for him is to free non-western scholarship of this coloniality. Jeremiah Chidozie Chukwuokolo coming from a “developmentarian perspective” (that is, a perspective in which the dominant existential concern is development) does not accept the identitarian perspective. For him, intercultural philosophy is successful when a scholar engages another culture in such a way that a fusion of ideas and horizons emerge; so that in the end the scholar’s horizon is broadened from its original state in some sort of synthesis with the secondary culture. In this regard, he thinks that, dialectically, African culture is a thesis, Western culture is its anti-thesis and in tercultural philosophy would provide, or be, the synthesis. Edward Uzoma Ezedike’s contribution on the whole could be seen largely as coming from the identitarian and nativist perspective. 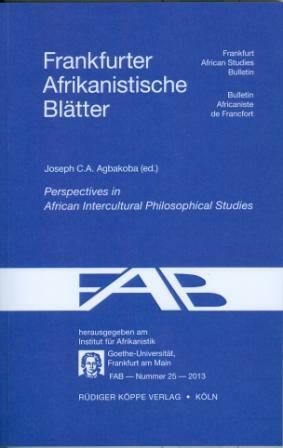 Joseph N. Agbo’s approach to intercultural philosophy is essentially comparative, pragmatic and utility oriented. He recommends certain practices in Africa rejected in the West on moral grounds and thereby affirms a certain form of relativism on functional and contextual grounds. Intercultural philosophy on this construal should respect relativity of truth and utility. This diversity of approaches to doing philosophy in Nigeria among younger scholars reflects the vibrancy of philosophy in the country as well as the search for the best way to address the existential problems of Africans in a philosophical manner.